This article explains how to retain idibu's applicant tracking functionality when redirecting candidates to your own websites (or landing pages). 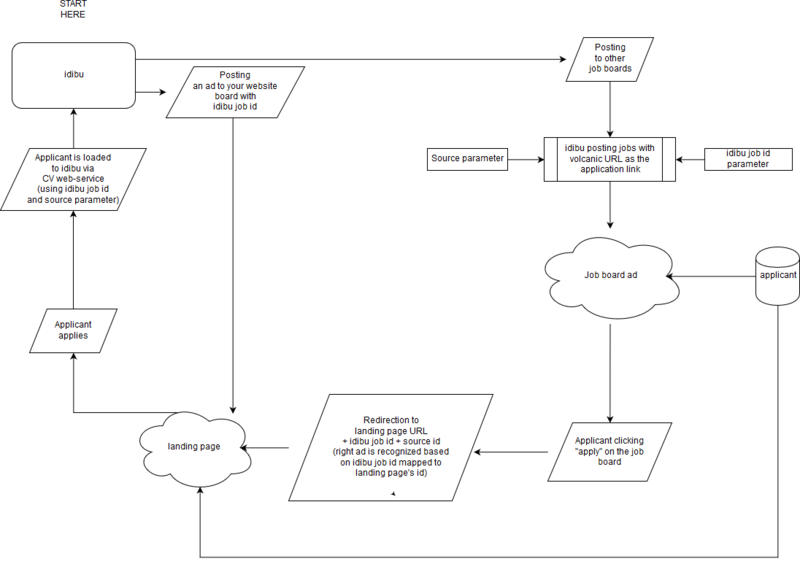 In such workflow, candidates won't be applying directly on the job boards, but instead, they will be re-directed to a corresponding landing page, where they will complete the application process. you are forced to look over your website very closely. If it fails, you will get no applicants and confuse the ones trying to apply from other job boards when your website is down. additionally, your website's idibu integration has to be bulletproof - if a job is successfully posted to other boards and not on your board, no one will be able to apply! Please mind that this article contains images that are tad too big for our knowledge base system. Please click on any image you'd like to see it in its full resolution in a different tab. Don't worry if it's confusing! We'll go through this diagram step by step now. In order to begin, first, let us know of your intentions by starting a ticket on support@idibu.com. ability to obtain idibu job id (base64 encoded) when you post your ad to your job board. It is to be provided as any other parameter that allows your website to create a landing page, i.e. job title, reference, etc. ability to open right landing page based on this parameter ( for example http://www.yourwebsite.com/ad.php?idibu_job_id=123a4 ). Important part! This part of the link: http://www.yourwebsite.com/ad.php? is called "landing page default URL". idibu will need to know that link. functionality, where idibu job id and source parameters, as well as candidate's name, surname, email and base64, encoded CV are uploaded to idibu using our CV Upload Webservice. Your developer can decide on the names for both variables (idibu job id and source) and values for different sources. However, we do have default values too and can provide a lookup for them. Just be sure to pass them over to your idibu account manager. enable force posting to your private website. Interested in lot simpler new redirection process? We got you covered! Click this link to find out how you can very easily use your own website as the place where candidates would apply for your jobs. Your consultant posts to idibu, let's say to Jobsite, Reed and Total Jobs. Apart from this, he is forced to post to your private board http://www.yourwebsite.com . On step 2 of the posting process, there will be an application URL field pre-populated with a landing page default URL. Consultant completes the posting process as per usual. In the next stage of the process, let's follow a candidate that found your ad on Jobsite. Candidate clicks "apply" and is redirected to your landing page on http://www.yourwebsite.com/ad.php?idibu_job_id=123a4&source=jobsite. Your website is able to identify the correct landing page based on the idibu_job_id parameter. and... that's it! Worth to note here, that applicants will be delivered to your consultants the same the always had, depending on your idibu settings. If it used to be by an email, make sure to populate subject and body fields with helpful information. This will be passed to your consultants, so good to have something useful there! As you can see the process went full circle and it has been tested and used by many idibu clients with full success. If you still have any questions, be sure to let us know in the ticket! We're more than happy to help!